The reality of Christ’s Ascension is so important that the creeds (the basic statements of belief) of Christianity all affirm, in the words of the Apostles’ Creed, that “He ascended into heaven, sits at the right hand of God the Father almighty; from thence He shall come to judge the living and the dead.” The denial of the Ascension is as grave a departure from Christian teaching as is denial of Christ’s Resurrection. Christ’s bodily Ascension foreshadows our own entrance into Heaven not simply as souls, after our death, but as glorified bodies, after the resurrection of the dead at the Final Judgment. In redeeming mankind, Christ not only offered salvation to our souls but began the restoration of the material world itself to the glory that God intended before Adam’s fall. 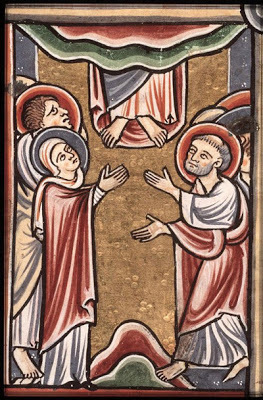 The Feast of the Ascension marks the beginning of the first novena, or nine days of prayer. Before His Ascension, Christ promised to send the Holy Spirit to His apostles. Their prayer for the coming of the Holy Spirit, which began on Ascension Thursday, ended with the descent of the Holy Spirit on Pentecost Sunday, ten days later. Let us pray. Grant us, Thy servants, O Lord God, we beseech Thee, to enjoy continual health of mind and body, and, by the glorious intercession of blessed Mary, ever a virgin, to be delivered from present sorrow and partake of the fullness of eternal joy. Through our Lord Jesus Christ, Thy Son, Who liveth and reigneth with Thee in the unity of the Holy Ghost, God, world without end. R.Amen. Let us pray. Graciously hear, O Lord, the prayers of Thy Church that, having overcome all adversity and every error, she may serve Thee in security and freedom. Through our Lord Jesus Christ, Thy Son, Who liveth and reigneth with Thee in the unity of the Holy Ghost, God, world without end. R.Amen. By Thy clemency, O Lord, and the intercession of blessed Mary, ever a virgin, may this oblation profit us unto eternal and also present well being and peace. Through the same Lord Jesus Christ, Thy Son, Who liveth and reigneth with Thee in the unity of the Holy Ghost, God, world without end. R.Amen. Protect us, O Lord, who assist at Thy mysteries, that, cleaving to things divine, we may serve Thee both in body and in mind. Through the same Lord Jesus Christ, Thy Son, Who liveth and reigneth with Thee in the unity of the Holy Ghost, God, world without end. R.Amen. Let us pray. Having received the aids of our everlasting salvation, O Lord, we beseech Thee, grant us to be everywhere protected by the patronage of blessed Mary, ever a virgin, in veneration of whom we have made these offerings to Thy majesty. Through our Lord Jesus Christ, Thy Son, Who liveth and reigneth with Thee in the unity of the Holy Ghost, God, world without end. R.Amen. Let us pray. O Lord our God, we pray Thee that Thou suffer not to succumb to human hazards those whom Thou hast been pleased to make sharers of divine mysteries. Through our Lord Jesus Christ, Thy Son, Who liveth and reigneth with Thee in the unity of the Holy Ghost, God, world without end. R.Amen.